Getting students to understand figurative language can be like pulling teeth! Last school year my class had an idiom of the week. We also studied similes and metaphors when they popped up in our reading units. Each time I was taken back by the number of kids that had a hard time understanding figurative language (it's no wonder they didn't get my sarcasm!!). Only a handful of students tried using figurative language in their writing. 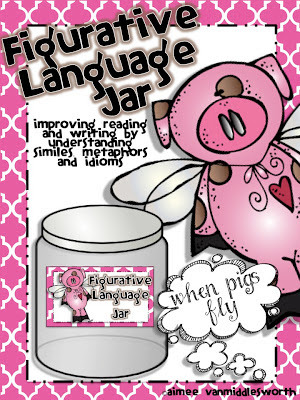 So, of course I decided that my classroom needed a figurative language jar!! I think they will really enjoy this jar. 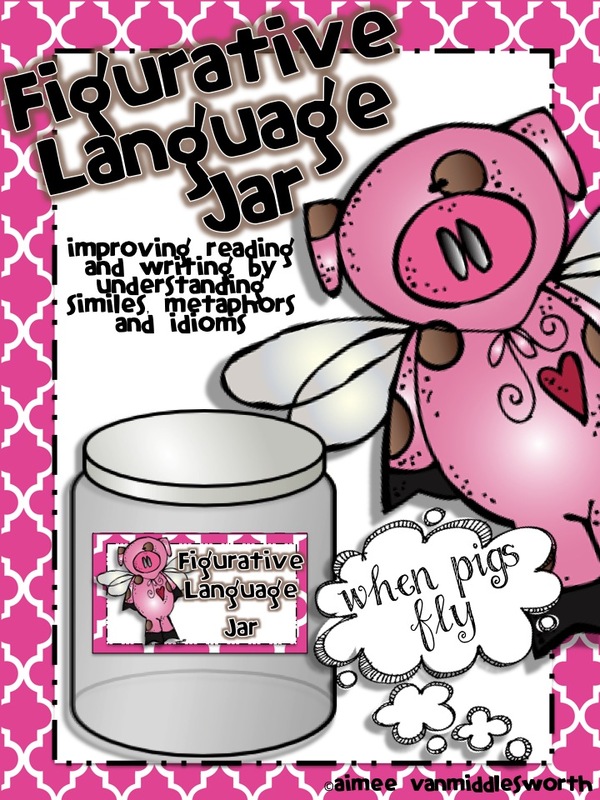 It has 126 idioms, similes, and metaphors. Students can sort them and complete the included worksheet. I mean how cute is the flying pig from Melonheadz!! If you would like to take a look at the preview you can check it out in my TpT or TN stores. I would also like to give one away. Just leave a comment about anything and I'll send a copy to someone tonight! I am glad school is out!! That pig is just adorable. What a cute unit. That pig is just too cute! My current class loved figurative language and sometimes with overboard trying to include it in their writing. This was my first 4th grade class that didn't struggle with understanding it. I would love to have this to use in my literacy center. Great unit! And that pig is too darn cute! 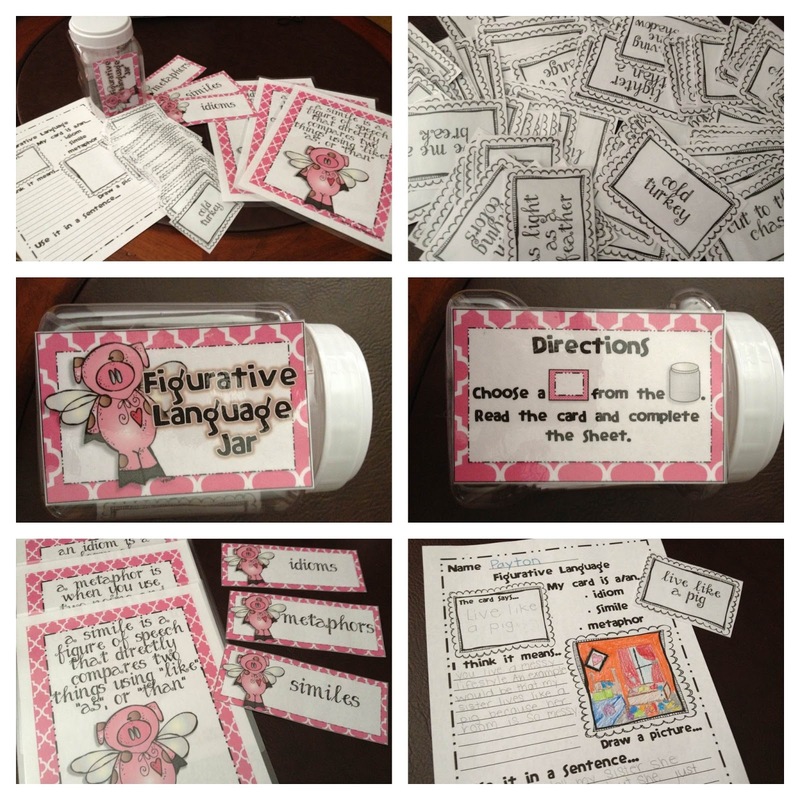 This would be a great way to practice and review figurative language! Piggies are adorable! I have a hard time getting my students to use figurative language as well. This would be great. Looks really cute....Last day of school and already trying to make improvements for next year! I am trying to "beef up" my figurative language materials. I love this! I've always struggled with getting my kids to use figurative language other than illustrating various similes and metaphors. I think this would be very engaging! Wow! Figurative language is hard but it is also fun. This is a great way to keep the kids motivated. Wonderful concept! I have been trying like crazy to win one of your jar activities! Those flying pigs are fun! This is a great idea. Love the graphics. Blessings on the reast of your year. This is so cute. I could really use this in my class. My kids would love this! I am adding it to my wish list for student teaching in the fall. Long time no post! Five for Friday! A Winner, a Sale, and a Freebie!!! Just a few hours left and a sale! Five for Friday on Father's Day! Four New Products and a Quick Giveaway! !